. CYP HDMI Inline Enhancer, Supports 2.25Gbps up to 1080P@60Hz. CYP HDMI Inline Enhancer, Supports 2.25Gbps up to 1080P@60Hz. CYP HDMI Inline Enhancer, Supports 2.25Gbps up to 1080P@60Hz. Self powered for a total of 30m max. using 2x 15m HDMI cables. The HDMI CDR with Equalizer from Cypress Technology can re-transmit a video signal without any loss. An extremely compact device, this system has a built-in CDR (Clock Data Recovery) equaliser that allows for long-range video transmission of Deep Colour Video. 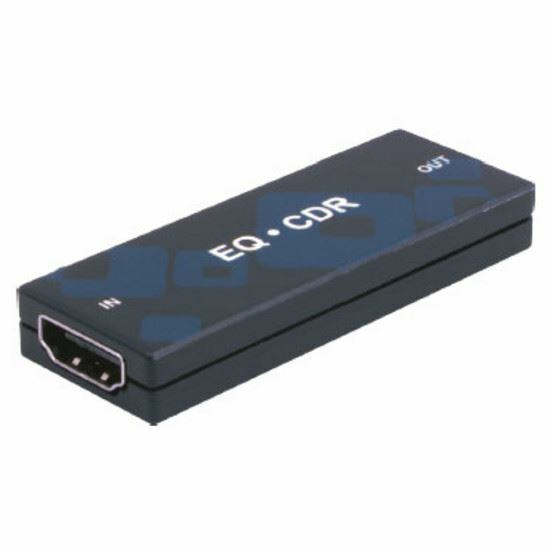 The HDMI CDR with Equalizer from Cypress Technology can also serve as an interim booster in complicated installations where dozens of devices are connected and weak signal points can occur due to the cascading of multiple layers of video. Designed to receive power from input equipment, the CS-HH is a compact way to boost weak video signals.